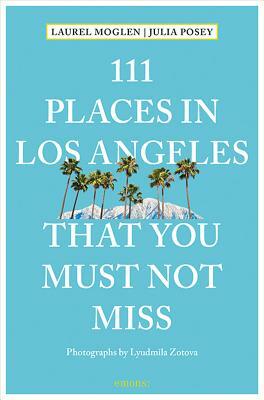 - Go beyond the glitz and glamour of Hollywood to discover the quirky culture of The City of Angels- Part of the international 111 Places/111 Shops series with over 150 titles and 1 million copies in print worldwide "In Los Angeles, everyone is a star." - Denzel Washington Adventures beckon For more than a century, seekers of sun and celebrity from around the world have flocked to this sprawling metropolis on the Pacific, which Dorothy Parker once described as "72 suburbs in search of a city." But beyond the red-carpet reputation and Tinseltown trappings is a west coast wonderland teeming with unexpected cultural opportunities, iconic architecture, gorgeous open spaces, quirky museums, hidden vistas, unconventional art, and obscure stories about the starlets, moguls, personalities, and players who have made Los Angeles their playground. This unusual guidebook explores 111 of the city's most interesting and unknown places and experiences: wander a serpentine path in a spiritual quest of your own making; channel your inner cowboy at a tried and true honky tonk bar; pay homage to the Dude at the bungalow where the big Lebowski lived; turn your car tires into musical instruments on the country's only musical road; sleep with the ghosts of Marilyn Monroe and Charlie Chaplin; view a constellation of stars more vivid than anything Hollywood has to offer; hug a redwood tree...in the middle of a Downtown LA restaurant; walk through an ancient forest; and hike to the 100-year-old ruins of a castle in the sky. From the San Gabriel Mountains to the Santa Monica Pier, longtime locals and intrepid visitors alike will fall in love with the real LA. Surprises await. Prepare to be captivated by the City of Angels. Laurel Moglen has worked for NPR stations in Los Angeles and created podcasts for organisations and companies including Travelocity covering what to do, see, and eat in cities around the US. Understanding the nuances of what gives a place its identity is her passion, and nowhere is it more fascinating, complicated, and mercurial than Los Angeles, her home for 20 years. Julia Posey is a born Angeleno. Like the Dude, she's worked in the music industry, public radio and, in her dire youth, even in a recycling truck. She is a writer, artist, and designer. She lives on one of the last remaining groves of the Lindsay Olive Orchard Tract in Highland Park in a ramshackle house with her husband, sons, sweet dog, and delightfully nefarious cat. Lyudmila Zotova's photographs have been featured in the Wall Street Journal, Yahoo News, and Eater, and she is the photographer of the book 111 Shops in Los Angeles That You Must Not Miss (Emons Publisher, 2015). Zotova is an alumnus of The Art Institute of California-Orange County and resides in San Diego, California.